In Summer 2005, Terry Gilliam's project The Brothers Grimm is to reach cinema screens. Filmed in Prague, it stars Matt Damon and Heath Ledger as the brothers Will and Jake Grimm. The script is written by Ehren Kruger and follows the Grimm Brothers as they try to make money by conning people into believing that monsters are terrorising their villages. 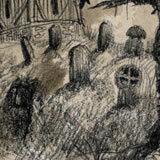 But the brothers are forced to deal with a real curse which is causing children to disappear. 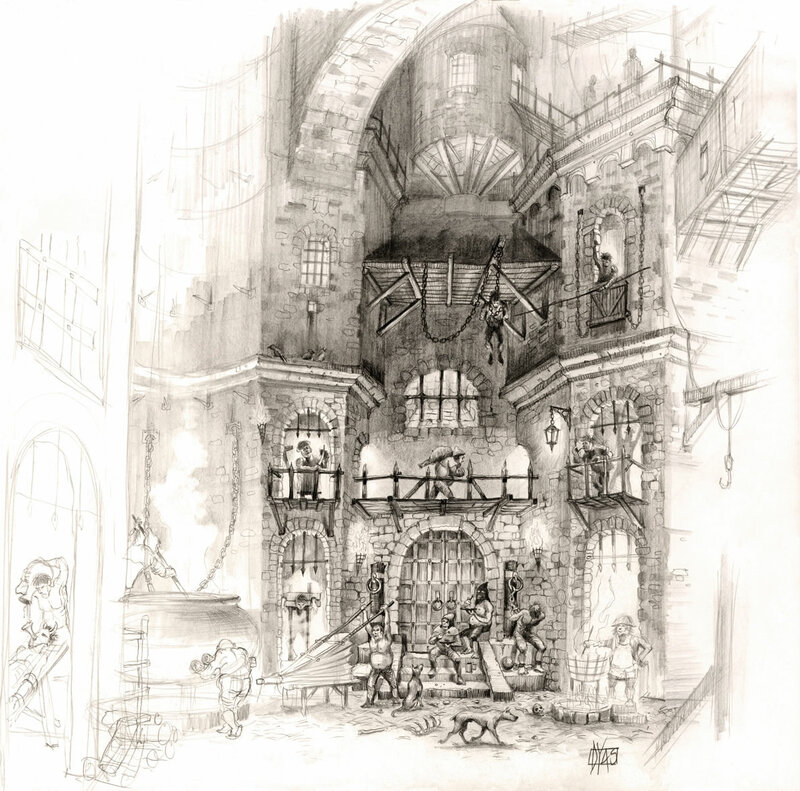 On this page Guy Dyas, the film's Production Designer, shares with us many of his Grimm sketches and provides a commentary on each one. Below the images, Guy talks to Dreams further about his work on Grimm. 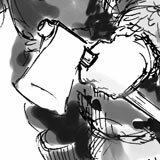 Click on each image to open up the full sketch. Image dimensions and file size are provided. 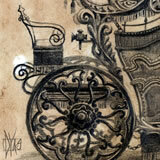 Early pencil sketch for the carriage which is meant to be Cavaldi's idea of a first-class mode of transport. This Carriage was custom-built and the end result is quite unique, very macabre and not unlike a funeral coach. At the end of our shoot it was given to Mario Luraschi, our horse stunts supervisor, so I imagine it now resides somewhere on his property in Northern France. 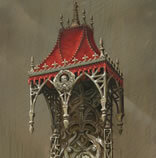 By far, the tower interior was our most ornate set. We created original floor to ceiling paintings and designed furniture such as the Queen's bed and throne. Creating the Marbaden village set was tremendous fun. We designed approximately twenty different houses including a church, stables, bridges and pathways. Many of the houses were used for interior scenes as well and the overall result was very realistic. 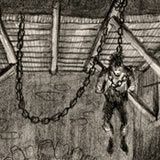 This is an early concept sketch I did for Delatombe's torture dungeon. The more Terry and I worked on this design, the more complex it became! Amongst the torture machines there was a 12-piece orchestra as well as a team of cooks running around preparing various meals. 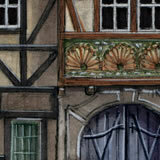 This is one of my colour studies for Karlstadt and it shows our design for the town square. We built this entire facade as part of our set for the scenes where the Brothers Grimm spend the night in a small tavern. 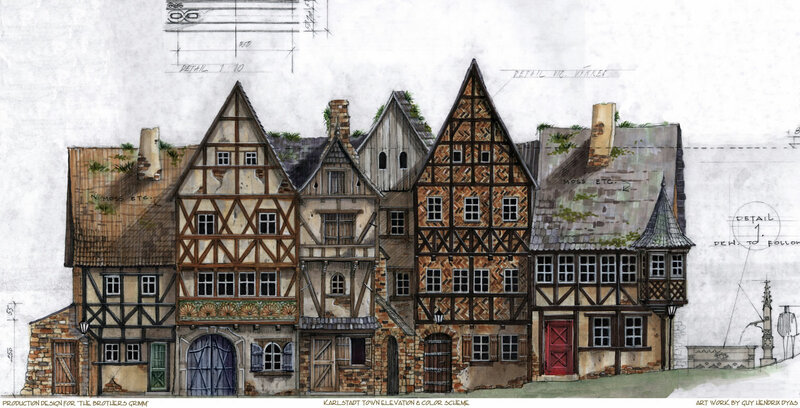 This is the very first sketch I did for the film and it shows our design for the Karlstadt Watermill. We ended up building it almost entirely as seen in this drawing on the studio backlot. 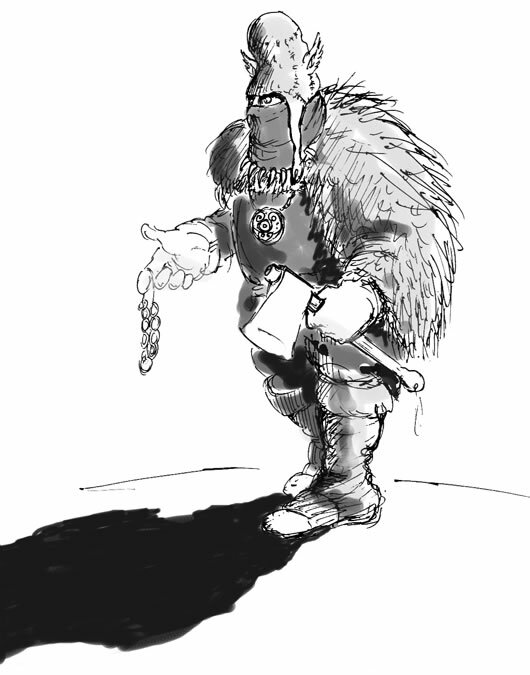 This is Terry Gilliam's sketch of the woodsman character. Phil Stubbs: Tell me a bit about yourself... where are you from, where did you study, and where do you live now? Guy Dyas: I'm from England and I grew up in South Devon. I moved to London where I got a degree from Chelsea School of Art and then my Masters from the Royal College of Art. I was then hired by Sony as an industrial designer and I lived in Tokyo for several years. Nowadays I split my time between Los Angeles and Europe. I feel really lucky to be doing the job that I do, as I've always loved films but also building things. Being a production designer allows me to combine both of those passions. 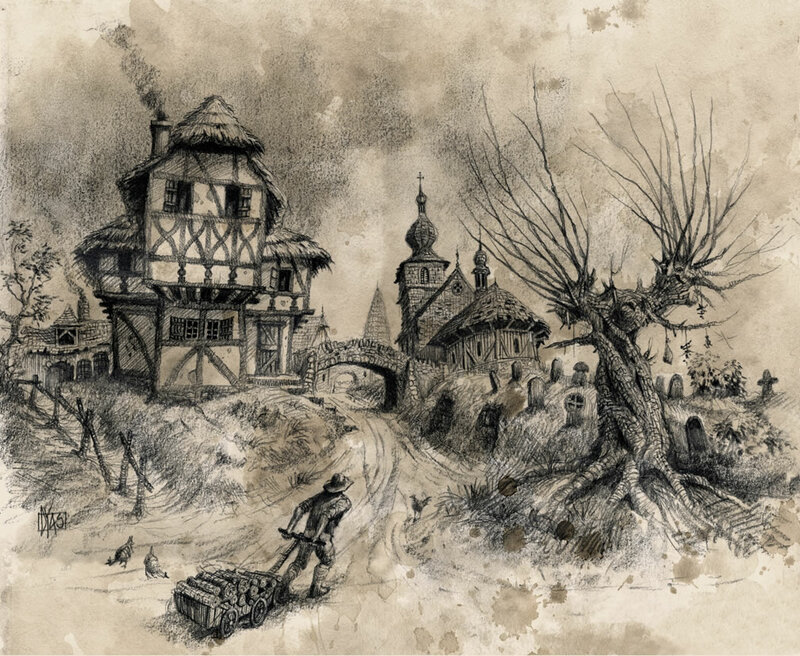 How did you get involved with The Brothers Grimm? I met Terry hot on the heels of finishing my first feature film as a production designer and I think I must have been on a shortlist of people he wanted to meet for Grimm. Terry's films are some of my favorite films of all time so I knew that being able to work with him would be an incredible lifetime experience. I still remember the impact of seeing Brazil as a student at the Royal College of Art. It was being shown as part of a special film series called Grand Illusions and it's such a masterpiece in filmmaking that it really opened my eyes to the art of production design. 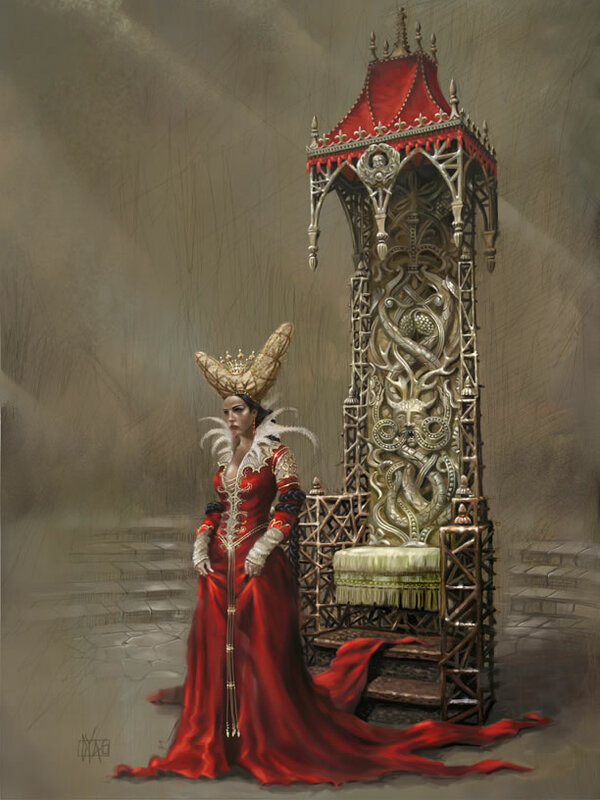 I remember that at the very beginning, even before Terry got the full funding for Grimm, I was working out of Terry's office in London and I thought I was still on a bit of trial period. 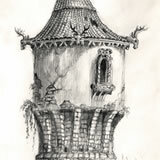 During that time I sketched as much as possible, trying to create some set-pieces that would really get Terry excited. That whole period was great for many reasons, it was all about getting ideas down on paper while not letting any budget constraints creep in yet! Terry has endless energy, he's very hands-on and he draws like a god! It's really easy to work for someone you wholeheartedly admire and want to impress. What are you most proud of on this picture? 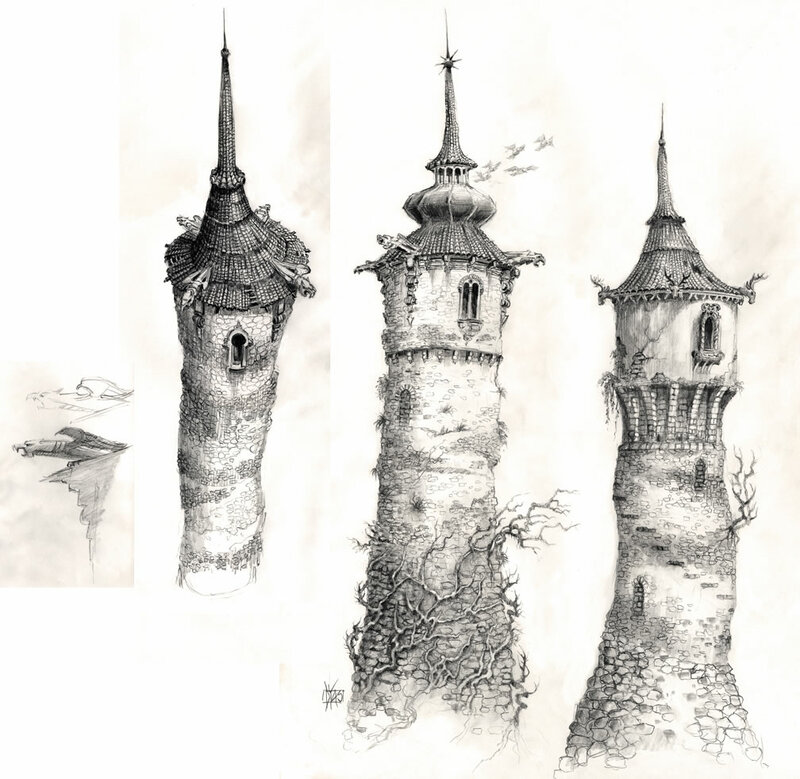 I was really excited by the source material, the original brothers Grimm fairy tales, which combined with Terry's unique vision helped us create a variety of amazing sets. Everyone really seemed to like our Marbaden village set. Everything on this film was a team effort and I saw it as a great opportunity to be able to work with all of Terry's longtime collaborators - his creative family. What resources / influences proved most useful in the design? Being in the Czech Republic, where the architecture is so unique and well preserved, was a definite advantage. It was the perfect place to do a film like Grimm and often Terry would take us on location scouts not so much to look for places to shoot but to experience the architecture and to draw inspiration from it. One night in the middle of winter, Terry lead us after dinner on a walking tour of Prague, it was starting to snow and we ended up by the famous Charles IV Bridge, which for once was deserted by tourists. This midnight walk through the streets of Prague truly gave us the impression that we had gone back in time. It's those moments that in retrospect turn out to be the most inspiring. 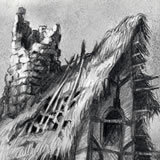 Tell me a bit about how the village was designed and constructed. decided that we should use a piece of land with a 280 degree view which had never been built on before. We knew that by building our sets on this very uneven terrain we would add some extra character to our village. Out of this process also came the need for us to build bridges and new foot paths which gave the set a whole new level of reality. How much time did you have from research through to design and build of the sets? We were on the film for almost a year so we had a good development phase, especially during my research period working with Terry in London. I think that in the end we had about 60 huge sets & set-pieces to create so it was all about running around in order to get everything ready on time. What are the best practices to avoid running over time deadlines and art department budgets? Making a plan and being able to stick with it because as anyone who's ever made a film will tell you, unpredictable stuff always happens. 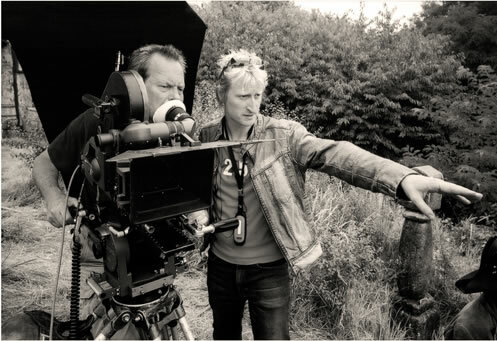 For me, having a director with Terry's experience and tenacity was invaluable. Terry knows what he wants down to every last detail and yet he's also able to make split-second creative decisions when necessary. It was very much full-steam-ahead working with Terry and I loved it. What is your involvement with the post-production CGI? I've seen some photos of the miniatures and matte shots and it looks great, but beyond having done some initial artwork for the set extensions I haven't been very involved in the VFX phase. Have you any projects in the pipeline? I'm currently in Sydney production-designing a new Superman film for Warner Brothers called Superman Returns. It comes out next year and it's very much in the line of the Richard Donner films with Christopher Reeve. Design-wise, it's an exciting opportunity to recreate Metropolis, a sort of stylized New York City.